Offer Review Dates Drive Higher Prices! Selling a property in today’s hot Seattle housing market has many Real Estate Brokers suggesting to their Seller’s to hold off and wait for a period of time before reviewing and accepting offers submitted by qualified Buyers. A frustration for many Buyer, this practice has lead to record high sale prices as Buyers compete for the listed property. However, price and property condition play a critical role in how well an offer review date will work for the Seller. Homes that are priced fairly (Listed at Fair Market Value) and that are in good condition tend to sell for much more than homes in poor or neglected condition. What’s the right amount of time to wait? 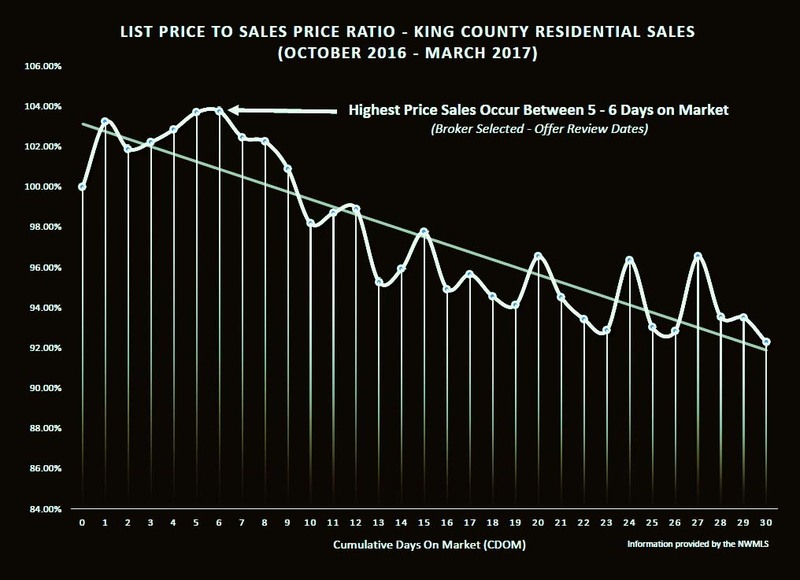 According to the statistics provided by the NWMLS database for King County, residential properties that review offers 5 to 6 days after they are listed sell on average for 104% more than the asking price. Some neighborhoods in King County are seeing sales at 110% to 120% over the asking price! Interested in learning more about this selling strategy? Is this the right approach for your property? Feel free to contact me and we can discuss this in more detail.